PRK, a form of refractive eye surgery offered at our St. Louis and Chesterfield practice, can be an effective alternative for patients who are not eligible for LASIK eye surgery. As in LASIK, Dr. Bruce H. Cohen uses an excimer laser to reshape the cornea, so that light rays can more effectively focus on the surface of the retina. 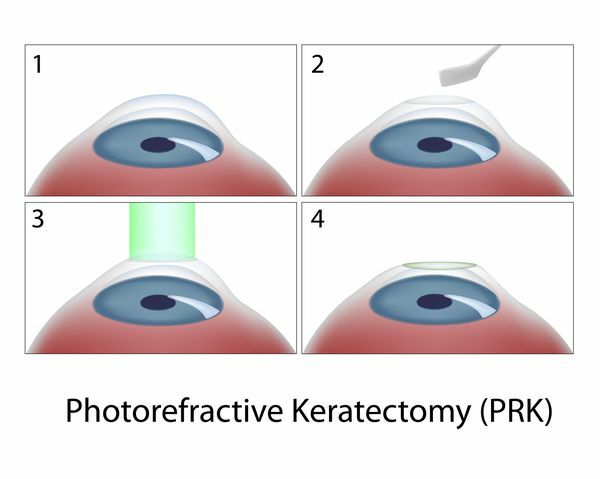 However, PRK (photorefractive keratectomy) does not require the creation of a flap in the cornea, as LASIK does. Safe and effective, PRK can help St. Louis-area patients improve mild to moderate nearsightedness (myopia) and astigmatism. During PRK, Dr. Cohen uses an excimer laser to reshape the cornea. In cases of nearsightedness, he will flatten the cornea so that the light rays focus directly on the retina. For astigmatic patients, the cornea is sculpted into a more regular shape; blurriness and double vision can be reduced or even eliminated. With Dr. Cohen's extensive experience performing PRK and other types of refractive eye surgery, patients in St. Louis, Chesterfield and surrounding communities can rely on superior PRK treatment. Like LASIK, PRK refractive eye surgery is an outpatient procedure. St. Louis, Chesterfield, and other Missouri patients can expect it to last about fifteen minutes. Unlike LASIK, however, no flap is created in the cornea. After applying topical anesthetic eye drops, Dr. Cohen removes the epithelial, or surface, layer of corneal cells. The recovery period for PRK is generally longer than for LASIK. Since there is no protective flap to cover the cornea, the patient has to wait until the layer of epithelial cells grows back. Following PRK, patients can expect to have blurry vision for about a week, and it may take up to a month for vision to stabilize completely. During your initial PRK refractive eye surgery consultation at our St. Louis or Chesterfield practice, Dr. Cohen will discuss the possibility of complications, including poor night vision, under-correction, over-correction, and corneal scarring. Many of these complications can be successfully treated with excellent results. Recent studies, overseen by the FDA, show that 95 percent of PRK patients enjoy post-operative vision of at least 20/40; this is the vision requirement for driving without corrective lenses in most states. During your consultation with Dr. Cohen, he will determine if you are an appropriate candidate for laser refractive eye surgery at our St. Louis and Chesterfield practice. In discussing your medical history and various health issues, he will be able to decide if PRK or LASIK is appropriate for you. You should let Dr. Cohen know if you have experienced any trauma or disease of the eye, as well as whether you are currently taking any medications that may affect the success of PRK. Pregnant women and those who are nursing should also delay PRK until after they have finished nursing, as these conditions can cause refractive error to change significantly. To learn more about the procedure and to find out whether you are a candidate for PRK, contact our St. Louis and Chesterfield practicetoday. You may be on your way to reducing or even eliminating your reliance on glasses and contacts.